We do just 2 gem shows each year, but we do the biggest and the best -- the Tucson show in February and the Hong Kong fair in September. 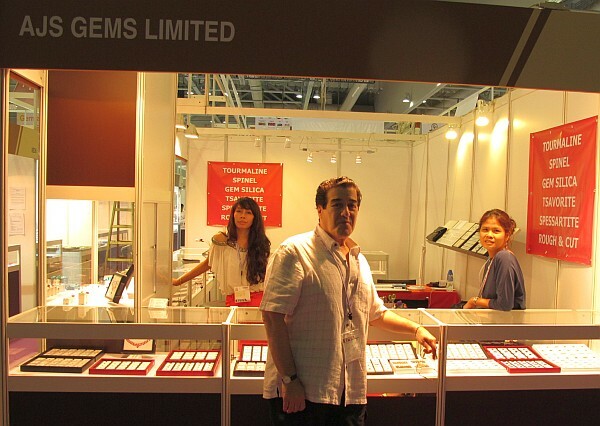 Both shows draw exhibitors and buyers from all over the world, and are regarded as bellwethers for the gem trade. This year was the 30th anniversary of the Hong Kong fair, which is so enormous that it fills the two large convention venues in Hong Kong. Colored gemstones and diamonds were at the AsiaWorld-Expo next to the airport, with finished jewelery at the convention center in Wanchai. There were more than 3,500 exhibitors in total from 48 countries/regions. The September Hong Kong fair has been the leading show in the world the last few years, due to increased buying power in the Asian market. 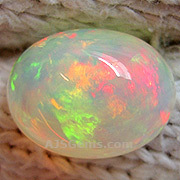 This has led to rapidly escalating prices around the world on colored gems. This year there were signs of a cooling off, with Chinese buyers more cautious and fewer Europeans in the market. Global economic challenges now appear to affect every country. We'll have to wait and see whether this has any dampening effect on gemstone prices. The hot colors at the show were vivid pinks, greens and blues. 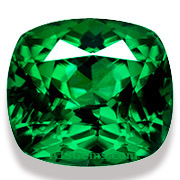 For us that meant Mahenge Spinel, Tsavorite Garnet, Tourmaline and Gem Silica. We introduced Gem Silica for the first time in Hong Kong and our display drew interest from almost every visitor that passed our booth. Buyers from Taiwan were especially interested, since they know this gem from a local deposit (they call it Taiwanese sapphire). But they had never seen the intense glowing blues and greens of the Arizona and Peruvian material we showed at the fair. We sold all the top grade material we took with us to the show, but fortunately we reserved many fine pieces for our website. 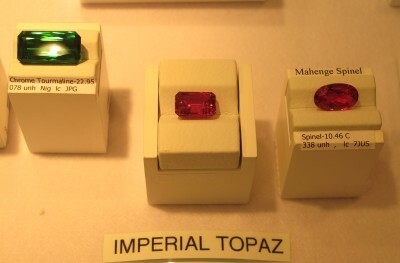 Another milestone for us in Hong Kong was our first showing of a very rare red Imperial Topaz from Brazil. Imperial topaz that has a hint of pink is especially valuable, but fully red specimens are almost unheard of. We recently acquired an 11.55 ct red topaz that is as red as a Mahenge spinel, as you can see from the photo of our display case in Hong Kong. 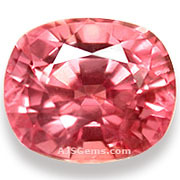 This precision-cut gem is very clean and has been certified by Gubelin Gemlab as "red pink." For those who missed us at the Hong Kong show, you can see us in Tucson in February. 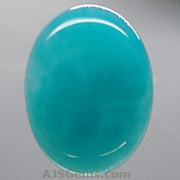 And of course we have a gem show online at Ajsgem.com every single day! 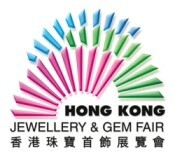 This month we highlight some of the fine gems that drew special interest at the Hong Kong gem fair. 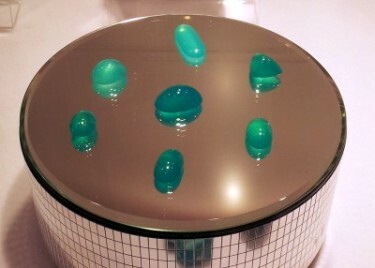 Click on any photo to go the detail page for the gem. After a year when gold prices have been relatively stable -- up about 10% for 2012 -- many financial analysts are predicting significant increases in the gold price for 2013. The reason is the decision by central banks, such as the US Federal Reserve, to adopt a policy of monetary easing. This means that central banks will act to reduce interest rates and boost the money supply as a means to stimulate economic activity. Or, to put it in plain English, they are going to print a lot more money. Gold then looks like an attactive investment. Analysts' predictions for the price of gold in 2013 range from $2,000 to $2,500 an ounce. Gold has already risen over 5% in the last 30 days to a close of around $1,780 on Oct 1st. One of the most legendary diamonds in the world, the 76.02 carat Archduke Joseph Diamond, will be auctioned at Christie's in Geneva in November. Famous for its perfection (D color, IF clarity) as well as its enormous size, this diamond originated in the Golconda mines of India. It was once the property of Archduke Joseph of Austria and was sold to an anonymous buyer in the 1930's. It then disappeared until it was offered at auction in 1961. It is expected to draw a price over $15 million. With the separate visits of Aung San Suu Kyi and Myanmar President Thein Sein to the US, Secretary of State Hillary Clinton announced that the US will finally lift remaining economic sanctions against Burma. "We will begin the progress of easing restrictions on imports of Burmese goods into the United States," Clinton said. "We hope this will provide more opportunities for your people to sell their goods into our market." 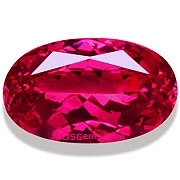 We now await news on the implementation of the new policy and will inform you as soon as it once again legal to import Burmese ruby and jadeite into the US. Tanzanite is a trade name, not a gemological name and is applied most often to the blue or violet color produced by heat treating reddish brown zoisite. But zoisite can occur naturally in a number of colors, including green, yellow and pink. The pink zoisite, often referred to as pink tanzanite, is especially valued by collectors. You can see some examples, including some pink uncut tanzanite crystals, on our Tanzanite page. There are several natural colorless gemstones which are sufficiently hard and transparent enough to be used as diamond substitutes. They include white sapphire, white zircon, danburite, petalite and goshenite. White zircon has the highest refractive index and the most fire, and was often sold as a diamond substitute in the days before diamond simulants like cubic zirconia and moissanite. 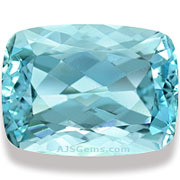 By the way, natural zircon is not related to cubic zirconia, which is a synthetic material.